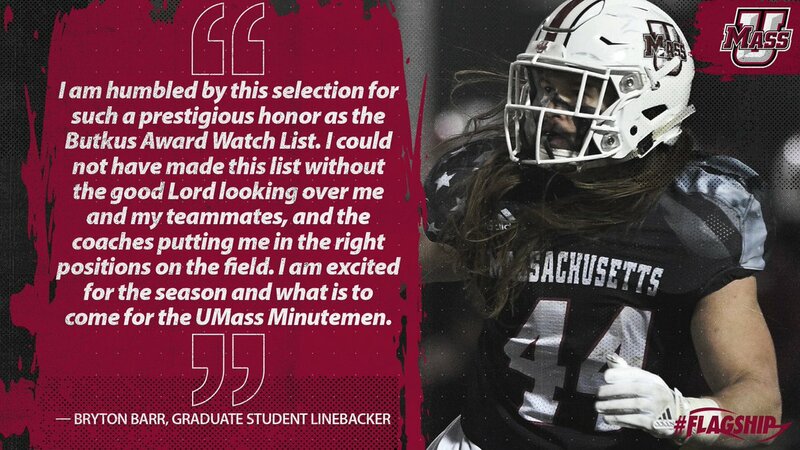 The UMass website has a post on Bryton Barr being named to the Butkus Award Watch list. Mike Traini of "Fight Massachusetts' also has entry on Barr being named to the watch list. 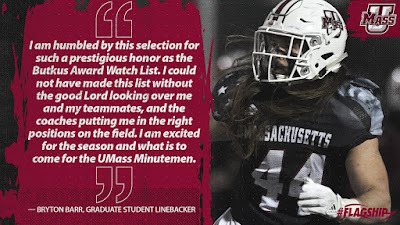 Outside of Joe Previte, the Minutemen returns only one career start for the rest of the available defensive linemen. Will UMass stick with the 4-3 or move to the 3-4? There are also not a lot of career starts available in the linebackers except for Bryton Barr and Jarell Addo. Bryton Barr SRGR 12-12 GP-GS 45 AT 50 UT 105 TT 9-42 TFL 5 SACKS 1 INT 1 FF. If the Minutemen start Addo, Barr and Ogbonna the UMass LB's will be 6-1 200, 6-0 225 and 6-2 215 respectively. Boston College's reported starters will be Connor Strachan 6-0 240, John Lamont 6-0 240 and Davon James 5-11 230. The Minutemen do not have a lot of size in the linebacker corps. They also could move Leon Flanagan 6-2 220 to LB. Penn Live has a short piece on Andrew Ford being named to the Davey O'Brien Watch list. Boston College has been picked fourth in the ACC East Division for 2018.The last few years the Eagles have been picked at the bottom of the ACC East. Barr is a beast...mccobrey will be in the olb spot....ruane will be in sane:) LB’s are solid DL have a lot to prove!